Breakfast for dinner is becoming a reoccurring theme in our house. Dinner has always been a challenge with three people that all want different things to eat. I have spent many a frustrated evening feeling like a short order cook. In the last six months or so my son has really become more adventurous and willing to try new things. (this is from a kid that spent 10 years eating nothing but pizza, macaroni and cheese and chicken and rice for dinner). It’s been exciting to find things that we can all eat together and have a true family meal. Pizza night is still a huge hit but we have added taco night, spaghetti night and most importantly breakfast for dinner night. It usually consists of a fried egg and bacon sandwich with homemade tomato jam (I see a few more posts in my future as I describe that one). Eggs are a huge part of our diet but my son never wanted any part of them until recently. Now that he has discovered the pleasure of a runny sunny side up egg a whole new world of dining possibilities has opened up for us. Yesterday I thought how about we combine our two favorite dinners into one? And that’s how breakfast pasta was born. 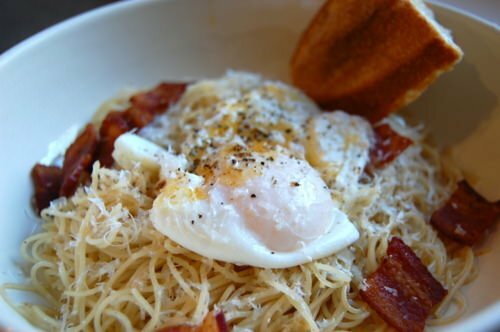 You fry up some bacon, throw in some pasta, cheese and top the whole thing off with a nice oozy, poached egg. 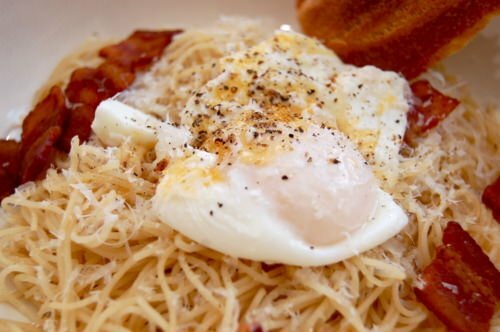 So go ahead and have yourself some breakfast pasta tonight, you won’t be sorry. The other thing I love about this pasta is how such a few simple ingredients can become such a delicious dish. Sometimes more isn’t more, it’s just hard work. 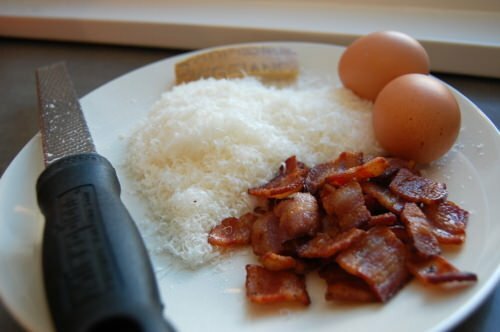 Cook bacon until crisp and then drain on paper towels and then break into bite sized pieces. Cook spaghetti in a pot of salted boiling water until al dente. Reserve 1/2 cup cooking water, then transfer pasta to a bowl. Meanwhile, heat a saute pan of water just until simmering. Add one teaspoon of white vinegar. Okay, this is the tricky part, take a wooden spoon and create a mini vortex in the pot by swirling the spoon. Wait for the storm to settle a little bit while you break one egg into a small heatproof bowl. Gently lower the egg into the middle of the swirling water and let cook until desired doneness 2-3 minutes. Repeat the process with the other 3 eggs. Remove eggs one at a time and let drain while you finish the rest of the dish. Pour off all but 1 tablespoon of the bacon fat, add the butter until melted. Finally add the pasta, reserved cooking liquid and all but 3 tablespoons of the cheese. Stir until a nice sauce coats the pasta and everything is heated through. 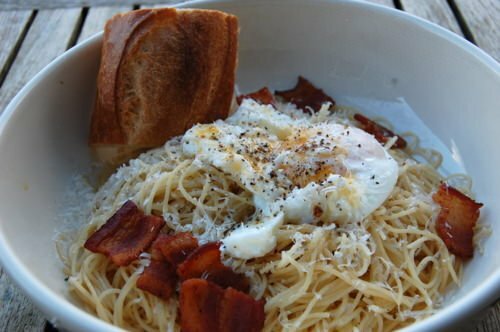 Transfer pasta to a bowl top with the reserved bacon, eggs, cheese and sprinkle with the herbs. This is a very flexible recipe. 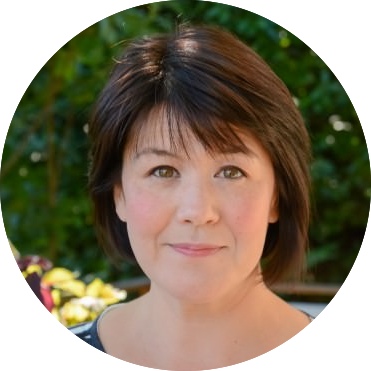 You can easily adjust the amount if you want to serve more or less people. For added nutrition add some vegetables (asparagus or zucchini would be delicious), just toss them in with the pasta the last few minutes of cooking.